Duck Soup. Paramount Pictures 1933. This was a consideration for May’s classics theme, and probably would have been a better fit than one of them. I was actually planning to include it before I realized that May might have had five Thursdays (the day I write on), but only four Fridays (the day I publish). 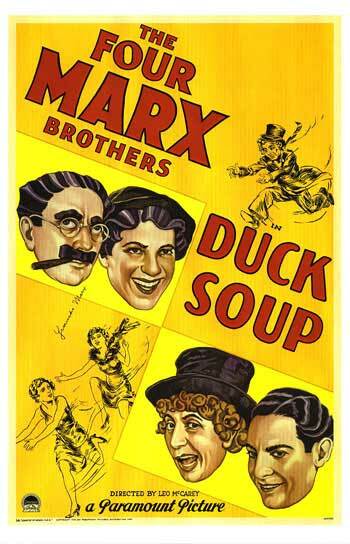 Anyway, here’s the Marx brothers doing political satire. On what? I don’t recall, but I think it’s about contemporary US foreign policy. I had fun keeping up a theme for a month. I’m thinking about doing another themed month soon, but it won’t be July. The nation of Freedonia is broke, and their chief benefactor, Mrs. Teasdale, won’t loan them any more money unless the current head of state resigns and they install her choice, charismatic statesman Rufus T. Firefly. As Firefly gets down to business in his unorthodox way, the neighboring nation of Sylvania is scheming to take over Freedonia through the efforts of their ambassador to Freedonia and his two inept spies, Chicolini and Pinky. This mainly results in Firefly, Chicolini, and Pinky being funny, but also there’s mention of revolution and war. I think I once tried to watch this, but couldn’t get through the first two scenes. The film feels like it starts as a standard political tale that gets derailed when the Marx Brothers take over major roles. It’s an entirely different movie in the minutes before Groucho’s Firefly shows up and violently resets the tone. And thank goodness he does, because until his appearance, the movie is bland sliding to awful (more on that in a moment). The story tries to make sense after this point, but it progressively just becomes a setting for Groucho, Chico, and Harpo to make jokes in, and it’s all the better for it. I liked Groucho’s comic scenes the best because he always seemed to have a sense of his purpose in the story, he just didn’t take it seriously. Chico and Harpo are unpredictable. Sometimes their actions have no story reason at all, sometimes they’re just terribly muddled. Harpo’s character doesn’t do much of anything that’s actually relevant to being a spy/agent for Sylvania, he just enjoys causing baseless mischief. On a second viewing, I could see myself appreciating Chicolini and Pinky a lot more, now that I’m not expecting them to advance the plot at all. Not even the most grounded part makes much sense. At the start of the story, the Sylvanian ambassador has decided that fomenting Freedonian revolution is unnecessary and his goals are better served by wooing Mrs. Teasdale while separating her from Firefly by sending his lover, a famous actress, to seduce Firefly. Firefly never interacts with the actress to any consequence, and while she’s still there, she doesn’t seem to be important anymore. There are three or four musical numbers in the film. Only one is not painful. Fortunately, the song I hated the most, “When the Clock on the Wall Strikes Ten”, is immediately followed by Groucho’s introduction and the only good song, “Wait Till I Get Through With It”, a joke about government that will never be dated. In the end, this film is a series of vaudeville sketches on a theme, except when the theme becomes inconvenient. It’s all right that the plot is bland, because that’s not the point. The point is Marx antics, and in that role it does brilliantly. Watch this movie: and try to spot a comic moment from Zeppo. Don’t watch this movie: for big political statements, surprisingly.